According to Gallup, the percent of Americans who approve of President Obama has dropped by 19 points from 68% in late January to 49% currently (new low). 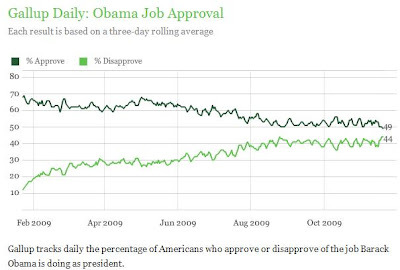 During the same period, disapproval increased from 12% to 44% (new high). Therefore, the approval-disapproval gap has shrunk from 56 points in January (68%-12%) to only 5 points now (49%-44%), a new low. Read more here. 47% approve, 52% disapprove, strongly disapproves 13 points ahead of strongly approves. rasmussen wound up having the most accurate polls in the last election. It's perhaps also worth noting that Rasmussen actually understated support for the Republican candidates in both the VA and NJ gubernatorial races. Rasmussen uses "likely voters" instead of "adults" or "registered voters". As you'd expect, that's a better populations for predicting elections. Also important is matching the makeup of the interview pool with the electorate. From realclearpolitics.com, CBS is showing 53% approval versus 36% disapproval. Seems way out of line, then you check the poll and they've "weighted" Democrats higher than their makeup in the interview pool and Republicans lower. Republicans were 311 out of 1167 respondents, "weighted" to 282 or 24%. Democrats were 414, "weighted" to 430 or 37%. Independents were slightly increased. I don't know the actual breakdown of the electorate, but I doubt there's such a high spread between Republicans and Democrats. The apparently out of line poll results helps support that. Unless you plan to prevent the South voting in the next election, I see little point in removing it from the poll. 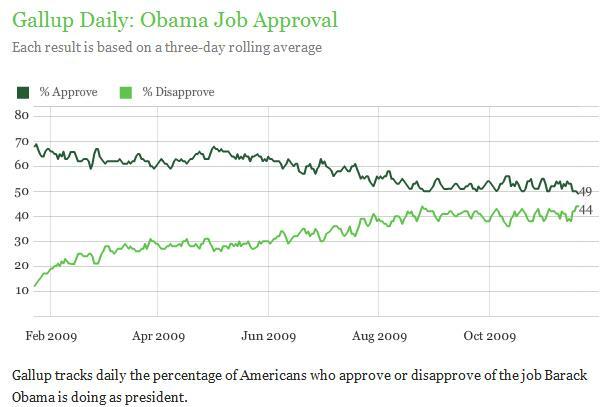 The stock market is echoing the inverse of the drop in Obama's approval and power. In the field of Political-Economy you have the Political Anger Factor Theory. That as the Published Unemployment Rate approaches 10% the Political Anger of the electorate begins to rise. When the Published Unemployment Rate hits 10%, then the Political Anger rises exponentially. Continued and persistent unemployment over 10% causes the electorate to remove the ruling party. However, the Real Unemployment Rate is north of 16%. The real issue is employment. You can not eat Cap and Trade nor can you eat Health-Care. You can’t eat phony job claims of the Spruce Goose of all Stimulus plans. The Obama Administration is in a real quandary. Keynesian Deficit Spending (Stimulus Plan) fell right on it fat little earmark-pork belly face (completely predictable). Meanwhile Government Tax Receipts are plummeting. Deficits are growing quickly and National Debt is climbing quickly. In other words, Hyper-Debt haunts the background. Lets see now, the lessons of The Great Depression were: Government Keynesian Deficit Spending had a crowding out effect. Further, Keynesian Deficit Spending created temporary employment that dried up once the barrowed money ran out. Rising taxes by federal, state and local governments stifled Private Capital Formation which is a direct engine of Private Sector Job Creation (long term jobs) That rising taxes caused tax levels to go past equilibrium of the Laffer Curve causing weak consumption patterns and further falling government tax revenue. That attempts to employ command and control (Schemes) into the economy created dislocations of resources. And finally add in Protectionism and the trade war that followed. Long before 2012, a shift in Congress could do wonders. Look at the close vote on moving healthcare "reform" to the floor. Look at who has been in charge of drafting the stimulus, the carbon bill, and all versions of the healthcare bill. Pelosi barely won the Speakership. Had there been a more even split in the House, its likely Hoyer would be Speaker. Harry Reid may not even be in office after the next election. Same for Dodd, and many of the other faces of the Democrats.